This costume was created and worn by me in Wilton Manors Florida at the 2017 halloween block party with thousands of people in attendance! 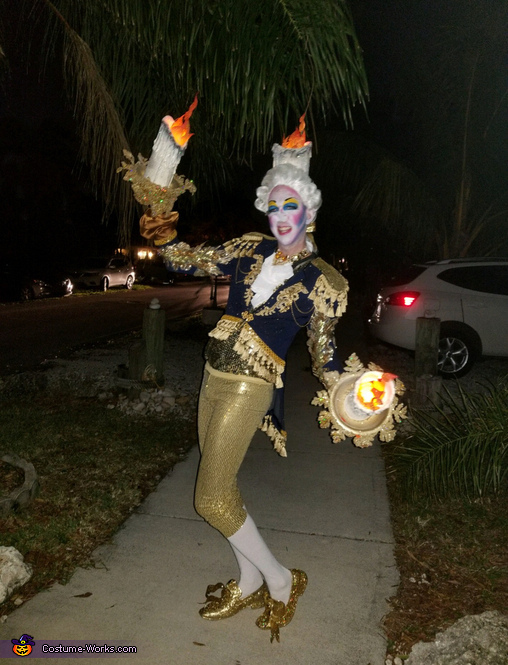 I was inspired by my favorite musical Beauty and the Beast, so I did my version of the broadway costume of Lumiere. The wig was purchased on eBay and styled in colonial fashion. The three candles were made by potato stick chips containers, using hot glue to mimic melting wax. The base of the two arm candles were made by plastic bowls and spray painted gold. I glued fake leaves spray painted gold around base of each bowl to make them more ornate. In each of the candles is battery powered LED lights, with paper cut into flame shapes, painted, and glittered to be flame like. The jacket was purchased in a thrift store. I hand stoned and applied the appliqués to the jacket. Also added gold fringe tassels to the jacket. The shoes were also purchased in a thrift store and I completely covered them in gold glitter and made the bows on top. The makeup was also completely done by me!